Born at Winnipeg in 1922, son of Frederick “Fred” Moist (c1891-1967) and Catherine Moist (c1886-1961), he joined the Winnipeg Fire Department in 1940 and served in the Royal Canadian Air Force (1942-1945) during Second World War, after which he returned to the force. He served as a Lieutenant, Captain, Head of the Training Division, District Chief, Battalion Chief, and Deputy Chief (1978). 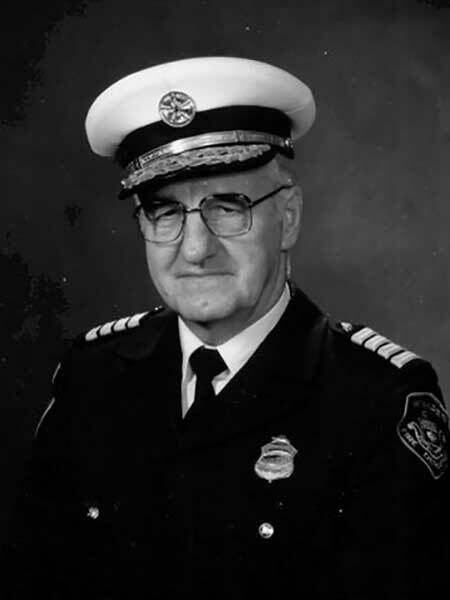 He then served as Fire Chief of Winnipeg (1981-1985), after which he retired. He was an active parishoner at St. Edwards, St. Mary’s Cathedral, and at John XXIII Roman Catholic Church / The Assiniboia Christian Centre. On 3 June 1950, he married Mae Edith Lailey (1925-2012) at Winnipeg on 3 June 1950 in St. Edward’s Church. They had six children. He died at the Deer Lodge Centre on 16 May 2012. “Mae Edith Lailey exchanges vows with T. L. Moist,” Winnipeg Free Press, 3 June 1950, page 16. Obituary [Catherine Moist], Winnipeg Free Press, 28 December 1961, page 19. Obituary [Frederick Moist], Winnipeg Free Press, 24 July 1967, page 25. “Moist appointment as fire chief caps 40 years with department,” Winnipeg Free Press, 20 November 1980, page 3. “Public, firefighter safety ex-chief’s vital legacy,” Winnipeg Free Press, 19 May 2012, page A10. Obituary [Mae Edith Moist], Winnipeg Free Press, 14 June 2012, page C13. Obituary, Winnipeg Free Press, 19 May 2012, page B19. We thank Larry Klassen for providing additional information used here.